Certain “a-ha” moments stick in your mind. One for me is of a management training session I attended more than 10 years ago. During that session, we were asked to work with a partner to build a simple toy airplane. The trick was only one person from each duo was allowed to build the airplane, and that person was blindfolded. The other team member was given instructions and told to verbally guide their blindfolded partner through the exercise, all while on a time clock. Here’s the point of the exercise. Half of the instructors were given a few minutes first to review the instructions and formulate a quick plan before the clock started. The other half were merely given the instructions as the clock started with no time to prepare. In the end, the teams who had a few minutes to plan were able to build their airplanes in significantly less time than those who had to jump immediately into the exercise. Sound familiar? While I’ve never heard of a construction company that doesn’t do planning before they start a building project, many don’t have the same discipline when it comes to IT planning. The results are non-integrated software solutions that cause duplicate work, inefficient work-arounds, and ineffective use of the technology itself. Start with your business objectives. Defining your most important short- and long-term business goals will help you determine what technology will most aligned with your business strategy. Assess weaknesses in your current IT infrastructure. Are some applications outdated or inefficient? Do you lack integration between important systems? Can your team access enough information at job sites? Get feedback from your employees. What technology do they need to do their jobs more effectively? Define the expected benefits. What positive impact do you expect each new technology to achieve? Benefits may include increased productivity, decreased costs, better communication, or more satisfied customers. Define the cost of doing nothing. Include a description of the business risks and potential costs of not investing in new technology. Consider a phased approach. You don’t have to accomplish everything at once. Sometimes it can be more cost-effective to adopt technology in stages. It can also be easier for employees to adjust to incremental changes. 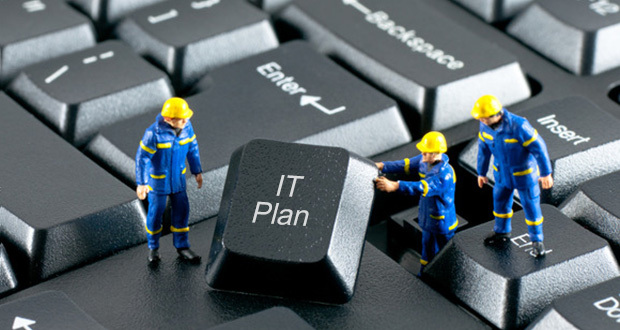 Find the budget for IT investments. Demonstrate how your proposed IT initiative will fit into the corporate budget. A phased approach may provide progress now without breaking the bank. Be mindful of longer-term goals. Although you may be planning initiatives for this year, look two, three, or even five years down the road. Investments made today should help to build the IT infrastructure you’ll need later. Plan to get employees using new technology. What processes can you put in place to help employees adopt new technology? For more information to help you jumpstart your strategic thinking process, visit our Sage Job Ready website and download from our growing library of IT planning templates.